Definition at line 39 of file llmediaremotectrl.h. Definition at line 43 of file llmediaremotectrl.cpp. References LLUICtrlFactory::buildPanel(), gUICtrlFactory, LLView::mIsFocusRoot, LLUICtrl::setIsChrome(), and TRUE. Definition at line 71 of file llmediaremotectrl.cpp. Definition at line 91 of file llmediaremotectrl.cpp. 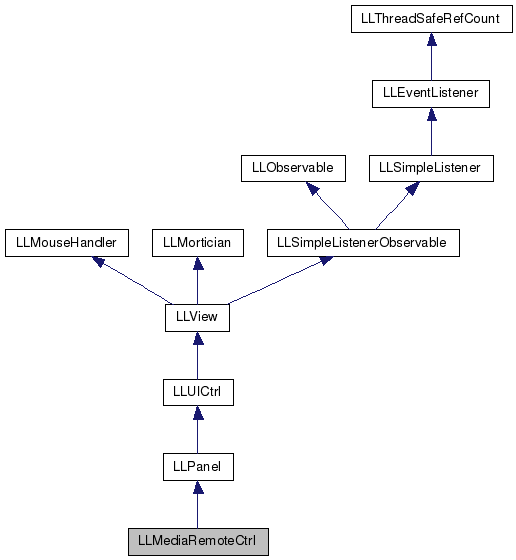 References LLPanel::childSetValue(), LLPanel::draw(), LLOverlayBar::enableMediaButtons(), LLOverlayBar::enableMusicButtons(), and LLUIInstanceMgr< T, INSTANCE_ADAPTOR >::instanceVisible(). Definition at line 83 of file llmediaremotectrl.cpp. Definition at line 78 of file llmediaremotectrl.cpp. Definition at line 56 of file llmediaremotectrl.cpp. References LLPanel::childSetAction(), LLOverlayBar::mediaPause(), LLOverlayBar::mediaPlay(), LLOverlayBar::mediaStop(), LLOverlayBar::musicPause(), LLOverlayBar::musicPlay(), LLOverlayBar::musicStop(), LLOverlayBar::toggleAudioVolumeFloater(), and TRUE.